A stunning ladies Sterling Silver and 14ct Gold Claddagh Ring with a Celtic Weave. The celtic knotwork is symbolic of everlasting life and everlasting love. 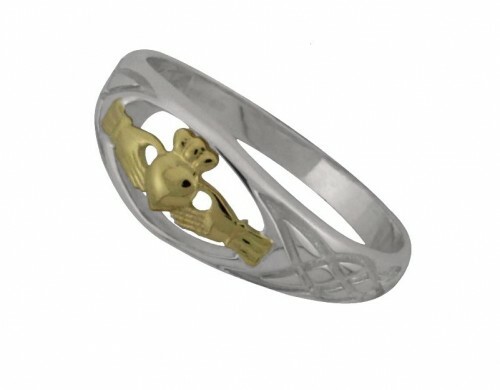 This is a unique stayle of claddagh, the 14ct gold claddagh symbol is cradled withing a sterling silver setting. Simply stunning. Hallmarked in the Assay Office in Dublin Castle..